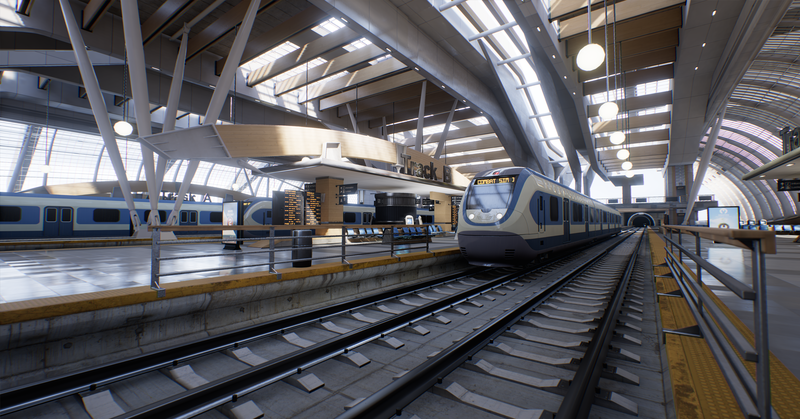 The other reason Bullet Train is worthy of more interest than a tech demo might otherwise warrant is that it's full of the little, intuitive things that make messing with VR or Oculus Touch a fascinating experience. You can grab a gun in each hand, for a start, and they don't have to be of the same type, meaning Bullet Train quickly begins to encourage different strategies for how you could face challenges. Adding in slow-mo bullet time has the added benefit of encouraging you to do crazy action movie stuff: You can throw a pistol into the air with your left hand, grab and fire an assault rifle, then drop it and catch the pistol again as it falls back down to keep firing. And you can pluck bullets out of the air and then toss them back, which gives you a slight Matrix vibe that could be applied to the full game in countless cool ways. The final "boss" encounter of Bullet Train, where you fight a big robot drone, actually requires you to catch and fling back the rockets it fires at you. Taken all together, Bullet Train's mechanics and its VR integration make the potential full game seem super intriguing. Bullet Train shows that, if nothing else, VR is going to do a few things very well. It's great for simulating the cockpits of spaceships and fighter jets. It seems perfect for oppressive, claustrophobic horror games. And it'll likely allow shooters to create intenser and more realistic experiences than they've ever been able to before. Phil Hornshaw is a freelance writer and the co-author of So You Created a Wormhole: The Time Traveler's Guide to Time Travel and The Space Hero's Guide to Glory: How to Get Off Your Podunk Planet and Master the Final Frontier. When he's not overthinking game stories, rewatching the films Alien or The Thing, he lives in Los Angeles with his wife and two annoying cats, and can be found on Twitter at @philhornshaw.